You know how on Christmas, Thanksgiving, and sometimes Easter you gather with family, stuff yourself to excess, and spend a couple of hours trying to catch up with everyone's activities during the last year? 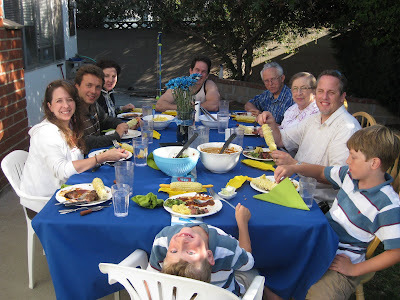 I've long felt that there should be a summer holiday which would gather the family together for grilled meat, fresh corn on the cob, and fruit-filled desserts. Not ones to stand on ceremony or stick with long held traditions, we made up our own! We invited Michael's brother Mitch, wife Jamie, his sister Holly, Alessandro, her friend from Italy, and Michael's parents to a Sunday afternoon food-fest complete with rib-eye steaks, 24 hour slow baked beans, corn on the cob, broccoli-bacon salad, blueberry cobbler and chocolate-caramel brownies. There was little to no conversation while everyone stuffed themselves silly! If you've been reading this blog very long, you know that I tend to not be a fan of cooking. But the strange thing is that I love cooking for a crowd, for special occasions. The little details, the planning, the prepping, and the gathering of a group of people I love together over a plate of delicious food brings me so much joy. Especially this group of people... Mike's mom who cooked three meals a day for a family of seven for decades, Mike's sister who is constantly coming and going with work, school, and dancing, and catching a meal when she can, and Mike's brother and sister in law who recently purchased a store and are dining primarily on fast food as they work crazy hours to keep the shop running smoothly. This, my friends, is a group of people who deserve to sit down and be treated to a fabulous and delicious home-cooked meal! 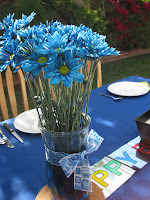 Michael rigged up a canopy over the back yard and we ate outside with the ocean breezes gently blowing across the nice tablecloths and plates and specially dyed blue and green flowers to match the green napkins. Even the boys were well behaved and charming toward our guests. I could hope for nothing more!